Whether you get up early to be in the vineyards for cool morning grape picking, stay up late for cellar pump-overs or just enjoy the mosbolletjies baked from the fermenting grape juice, the energy of harvest time in the Winelands is hard to resist. At La Motte, we invite you to share in the excitement with our annual Harvest Experience. Join one of our enthusiastic and knowledgeable wine tasting ambassadors during harvest time for a celebration of the unique harvest traditions. In the vineyard – enjoy an introduction to the various varietals, harvest processes and the estate’s biologic farming practices. Spot the differences between the various varieties and taste the sweetness of the ripe berries. In the cellar – experience the hand-sorting of grapes, crush, pump-overs and other cellar activities, concluded with a tasting of grape must (fermenting grape juice) from a fermentation tank. 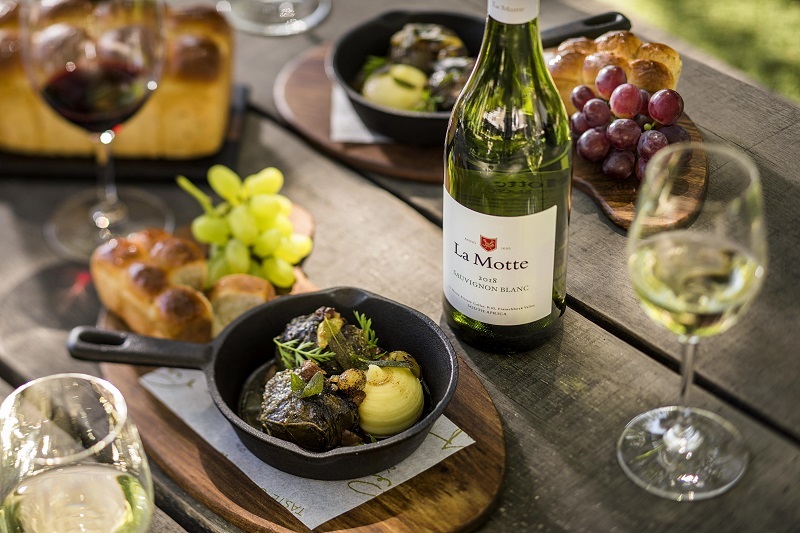 In the tasting room – sit down to a tasting of La Motte’s award-winning collection of wines – five wines from the La Motte Collection as well as the two wines from the estate’s renowned Pierneef Collection. In the shade of the age-old oaks – relax in the calm ambience of the estate gardens and enjoy Chef Eric Bulpitt’s special Harvest Plate. Enjoying your time with us? Why not linger longer and try sharing plates from our Garden Menu – with a glass of wine of course! The Harvest Experience at R100 per person includes the vineyard and cellar tour as well as wine tasting. It takes about 90 minutes and will be available hourly from Tuesdays to Fridays, between 10:00 and 15:00 from 1 February to the end of harvest (mid-April). The Harvest Plate is additional and optional and is available at R140 per person.